Is it possible to debug Xamarin.Mac application remotely using Visual Studio for Mac? I have my Xamarin.Mac application running on a Mac in my local network. I want to debug it remotely. Is it possible to use Visual Studio for Mac to connect to the running app over the network? but I'm unable to do this with my current version of Visual Studio for Mac (7.6.6 build 17): when I press "Debug" it just starts the local app and doesn't show "Launch Soft Debugger" window. 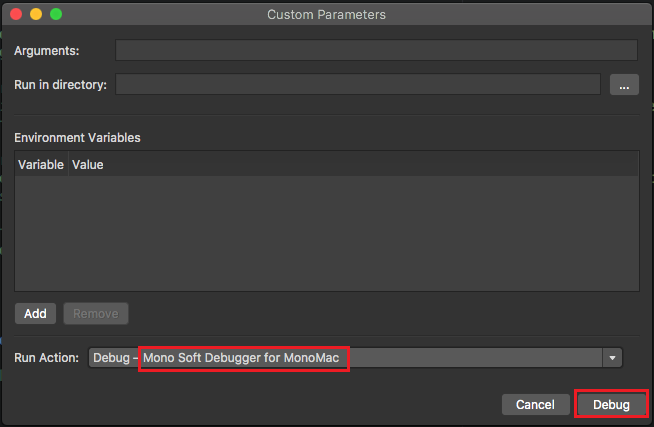 I've also find a Stackoverflow post: https://stackoverflow.com/questions/23108728/mono-remote-debugging-from-visual-studio/44045907#44045907 but it seems valid for Xamarin Studio only, not for Visual Studio for Mac. Any ideas? Please let me know if I need to provide any details. I don't know of any feature of that type for Visual Studio for Mac with Xamarin.Mac. You could also in the general Visual Studio for Mac section of the forums. You could also suggest it as a feature request on Developer Community.